For individuals who have an allergic reaction to latex, this selection of commercial synthetic gloves is the perfect alternative. These gloves are nontoxic and nonallergenic. 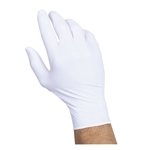 We offer powder-free disposable synthetic gloves and also those that are powdered with cornstarch. These medical-grade gloves are perfect for food service use and especially practical when frequent glove changes are required. Our bulk synthetic gloves come in all sizes, from small to extra-large, and there's even a one-size-fits-all option. These come 4 boxes per case with 500 gloves per box for a total of 2000 pieces. We even feature powder-free aloe vera gloves that condition your hands while you're wearing them! Disposable safety Synthetic gloves protect your hands and give you comfort in doing your job.